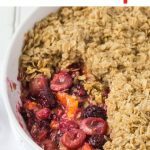 Gluten Free Fruit Crisp is a perfect way to combine seasonal fruits for a really delicious baked dessert that is low enough in sugar per serving it also doubles as a healthy breakfast. You can serve it hot or cold, with ice cream, whipped cream, or simply enjoy it on it’s own with nothing in addition. 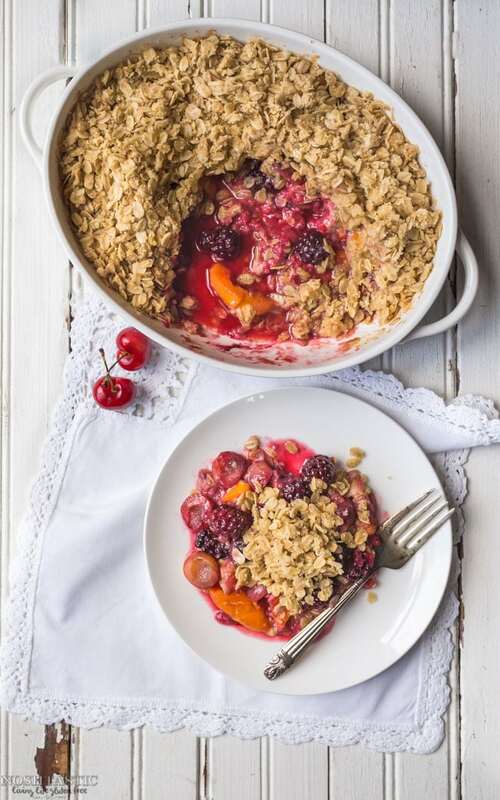 For my Gluten Free Fruit Crisp you can mix up the fruit a little from the selection I’ve used depending on what’s in season and available to you locally. I used apricots as I already had them in my fridge but ripe peaches or nectarines would be a lovely alternative, I haven’t found any ripe peaches worth eating so far as it’s probably still a little early for them. Blueberries instead of blackberries would also be an easy substitution. Making the topping is pretty easy and just requires mixing together to get it ready to add to the fruit. Don’t get too hung up on the size of the butter chunks, once it starts to cook it will all melt together in the oven and come out nice and crispy. If you’re using cherries in your crisp then your life will be a whole lot easier if you use a cherry pitter. You’ll also need an 8×8 ovenproof pan to bake it in. I have found that there’s a little bit of a tradeoff between getting a super crispy topping which sometimes results in the fruit getting really soft the longer you cook it, or having the fruit hold it’s shape a little better but not having such a crispy topping. It really comes down to personal preference so you can adjust the cooking time according to what you want to achieve. Either way it’s very tasty and I don’t think you’ll be disappointed. I made it for dessert recently and had the leftovers for breakfast, delicious! And if you’re looking for another option for dessert, you might want to try this lovely gluten free bread pudding. Gluten Free Fruit Crisp is a perfect way to combine seasonal fruits for a really delicious baked dessert that is low enough in sugar per serving it can double as a healthy breakfast. You will need an 8x8 size oven proof baking dish to bake this in. Cut the apricots into pieces and pit them, then cut the cherries in half and pit them also. Add all the fruit to a bowl with the brown sugar and stir gently to combine. 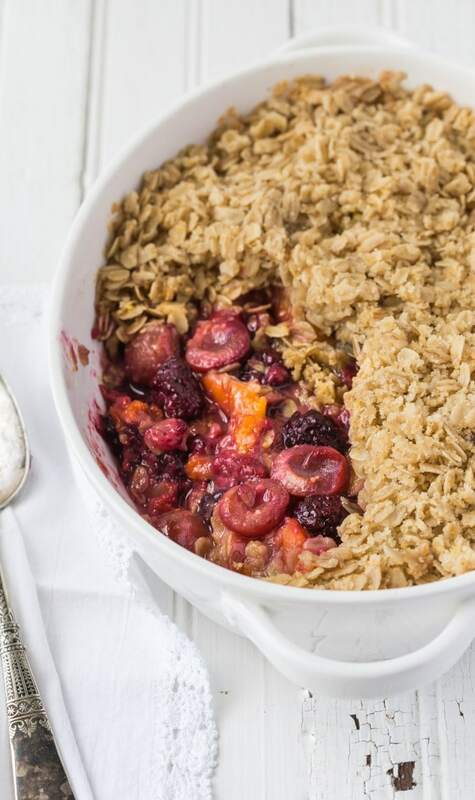 Transfer the fruit and sugar mixture to your baking dish. Cut the butter into very small pieces, less than an inch in size. Add the chopped butter to a bowl with the remaining topping ingredients and mix together. 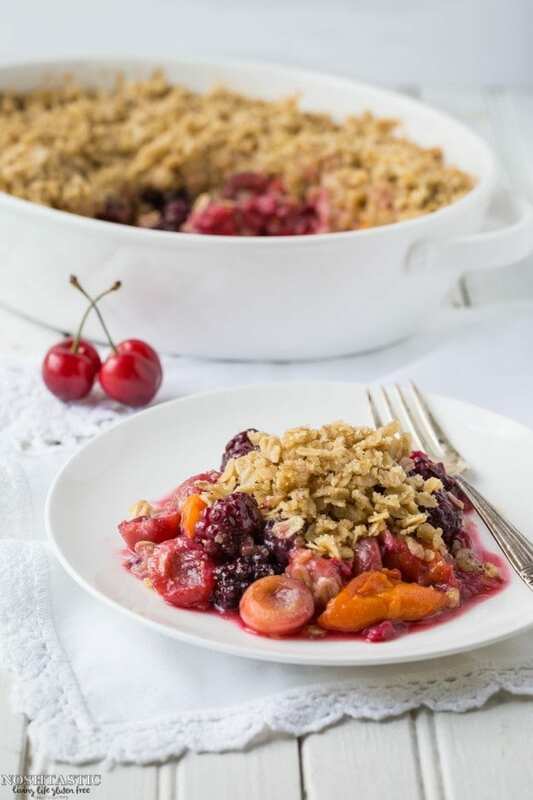 cover the fruit mixture with the topping and cook for 30 - 40 minutes, until topping is just a little bit brown on top. I have found that there's a little bit of a tradeoff between getting a super crispy topping which sometimes results in the fruit getting really soft the longer you cook it, or having the fruit hold it's shape a little better but not having such a crispy topping, so if you want it more crispy you may need to cook it a bit longer. Let it cool down for a few minutes before you serve it.